Stress is almost always seen in a bad light and the common assumption is that highly stressed and overworked people have a higher risk of getting a stroke. So, when Finance Minister Heng Swee Keat collapsed during a Cabinet meeting nearly two weeks ago, some were convinced that stress was definitely part of the equation. He had suffered a sudden stroke due to an aneurysm - a localised weakening of a blood vessel - and needed surgery to relieve pressure in his brain due to the bleeding. Law and Home Affairs Minister K. Shanmugam wrote on Facebook that he had been working closely with Mr Heng and could see that he was very tired. "I have been telling him that he was overworking so much that it will affect his health." Stress and working long hours are indeed associated with stroke, but they are not the direct cause of one. Stress could, however, affect the risk factors for stroke, such as high blood pressure. Habits such as smoking, drinking and overeating can cause high blood pressure. A stroke occurs when there is bleeding or a blockage in a blood vessel caused by a clot. Over the years, numerous studies have attempted to draw a link - though that does not prove cause and effect - between stress and stroke. The latest meta-analysis - published last year in Neurology, the medical journal of the American Academy of Neurology - combined six studies of 130,000 patients and found that high-stress jobs were associated with increased risk of stroke. Another meta-analysis of 25 studies published in The Lancet medical journal found that the longer the working week, the higher the risk of stroke. For instance, those who worked more than 55 hours a week had a 33 per cent increased risk of stroke compared with those who worked 35 to 40 hours a week. The study's authors suggest that unhealthy behaviour such as physical inactivity, sitting for prolonged periods and the triggering of the stress response might be behind the increased risk. They concluded that more attention should be given to the management of vascular risk factors such as diabetes, hypertension and obesity in those who work long hours, so that their stroke risk may be decreased. "Epidemiological studies have shown that high-stress jobs are associated with an increased risk of cardiovascular disease, especially hypertension and coronary heart disease," said Dr Vincent Ng, a consultant at the National Neuroscience Institute's department of neurosurgery. Dr David Choy, a consultant at Raffles Neuroscience Centre, said the dangers of overwork were noted in 1969, when a 29-year-old male worker in Japan died of a stroke. They called it karoshi, or death by overwork. How exactly stress contributes could be in sleep deprivation, he said, as multiple studies have shown strong links between sleep loss and the development of hypertension and even diabetes. But there is no evidence to show that chronic work stress can be the direct cause of a brain aneurysm rupturing and leading to subarachnoid haemorrhage, a type of haemorrhagic stroke. Most aneurysms develop after the age of 40, and more women than men are vulnerable. In most cases, why they rupture is unknown, though smoking and high blood pressure raise the risks of rupture, especially in young women, said Dr Ng Puay Yong, a neurosurgeon at Mount Elizabeth Hospital. Brain aneurysms can rupture at rest or under momentary stress, such as during vigorous exercise or anger. "The common feature of these triggers is that they induce a sudden and short increase in blood pressure, which results in an aneurysm rupture," Dr Choy said. "Stress can and often does cause a sudden rise in blood pressure. In people with an undiagnosed aneurysm, this may potentially result in a rupture." When an aneurysm ruptures, the sufferer will experience a "thunderclap headache", a sudden, severe headache often described as the worst headache of one's life. "If there is no intervention, about 15 per cent of these patients die on the spot, 15 per cent die in the next 24 hours and 15 per cent in the next six weeks," said Dr Ng. They die from the massive brain injury from the initial bleeding. 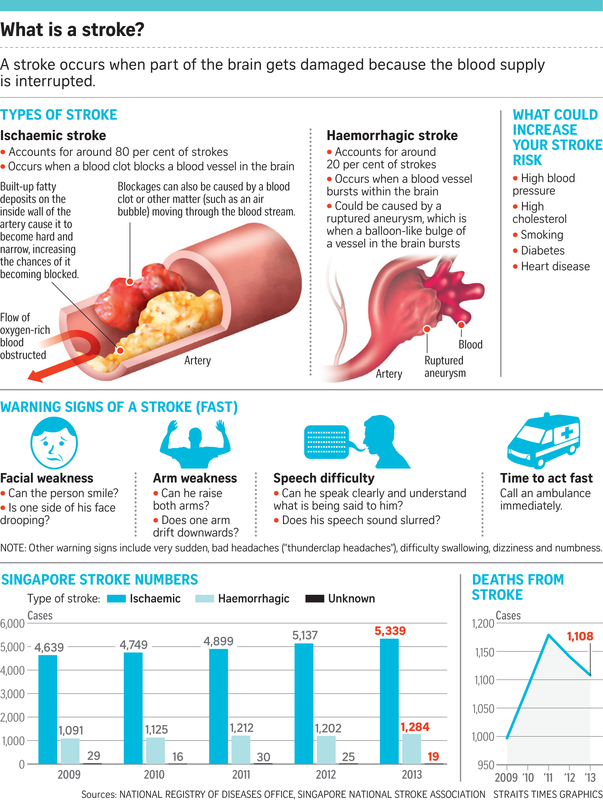 "Of those who survive, about 66 per cent suffer some permanent neurological deficit," said Dr Teo Kejia, an associate consultant at National University Hospital's division of neurosurgery. Psychological stress, which can cause a temporary rise in blood pressure, may raise the risk of high blood pressure, he said. This in turn raises the risk of haemorrhagic strokes, including aneurysm-related strokes. "We blame stress for a lot of things, but there's no scientific study to prove the link between stress and stroke," said Dr Ng. "We know only that certain conditions - such as smoking - can increase the risk." And smoking is what some people do when they feel stressed. The problem with linking stress to diseases is that it is difficult to quantify stress and determine the extent of its impact, but it seems likely it has an adverse impact on health. "A certain degree of stress may improve performance and engagement. However, prolonged and excessive stress may lead to burnout," said Dr Ng. "The symptoms of burnout include feelings of being overwhelmed and inability to meet constant demands, demotivation, low productivity and lack of energy. It leads to depression and anxiety."